Pumpkin Production in California (PDF) - Information from the UC Vegetable Crops Research & Information Center about pumpkin production areas and seasons, varieties and planting techniques, cultivation, quality, integrated pest management, harvesting, postharvest management, and marketing. 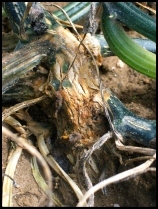 Identification of Fusarium solani f. sp. cucurbitae Race 1 and Race 2 with PCR and production of disease-free pumpkin seeds (PDF) - Discusses identification of fusarium fruit rot in pumpkins as well as methods for control of the disease.